An influential Sunni Muslim cleric said on Monday that only dialogue could solve Iraq’s crisis, sounding a conciliatory note on the threat posed by Sunni Islamist insurgents that could further polarize the Middle East along sectarian lines. Fighters from the radical Islamic State of Iraq and the Levant (IS) have seized a swathe of northern Iraqi towns, as well as border posts with Syria, in a thrust towards Baghdad, stunning the country’s Shi’ite Muslim-led central government. Sunni Saudi Arabia has blamed Iraqi Prime Minister Nutria al-Maliki, saying his rule had incurred Iraqi Sunnis’ wrath, and hinted that Shi’ite Iran should not enter the fray in Iraq against the militants. ‘There’s no doubt that Sunnis all around the world are being repressed but even more so in Iraq under the Shi’ite leadership,’ cleric Youssef al-Qaradawi told a news conference in the Qatari capital Doha. 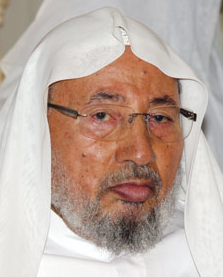 ‘I have called for bridging the differences between Sunnis and Shi’ites, and in the past I traveled to Iran to initiate dialogue…,’ said the Egyptian-born Qaradawi, who is revered by millions of Sunni Muslims worldwide. Qaradawi has his own history of incendiary remarks regarding Shiites and what he sees as their threat to the Sunni Muslims.